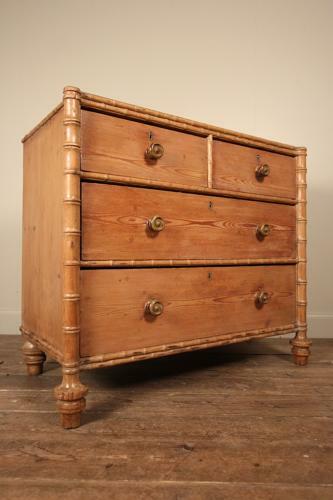 A beautiful Regency Faux Bamboo Chest of Drawers in Pine, with wonderful proportions, having an arrangement of 2 short and 2 long drawers and flanked by Bamboo caved pillars terminating in ring turned feet. Retaining the original knob handles with a fantastic mellow colour, in superb condition throughout. English, Circa 1820.